Writing isn’t a lucrative career–certainly not at my level–but it’s incredibly rewarding. I love writing and would do so even if nobody else read my words. When I wrote a novel for middle-grade kids, I was over the moon when I thought it was on the path to publication. But it never happened. My husband, my daughter, my writing critique group, and my agent read it, but it never reached its target audience. Sigh. But being a playwright has a distinctive benefit. Getting plays produced locally means I actually get to sit in the audience and get a feel for what works and what doesn’t. It is just about the best feeling in the world to hear laughter all around you when actors utter your words (presuming, of course, that your intention was to be funny). Tonight is a big night for me because I have several friends joining me to see my short play, “Where There’s a Will,” at PianoFight, part of SF Theater Pub‘s Pint-sized Play Festival. I have a great director, Vince Faso, who is also a middle-school drama teacher. 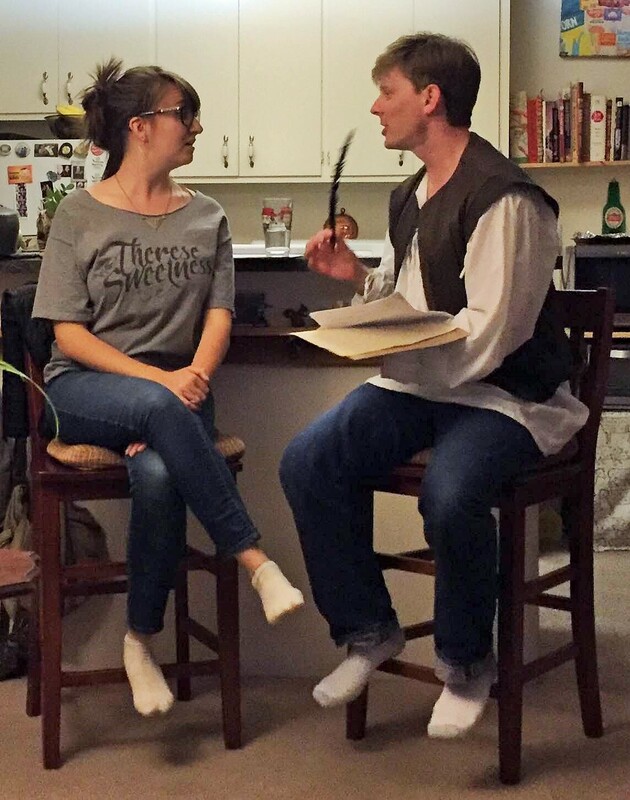 My cast is the talented and beautiful Layne Austin, who plays Cordelia, and comically gifted Nick Dickson, who gets to be the time-traveling bard. The rules for this festival is that all the plays must be ten minutes or shorter, the setting has to be a bar, and someone is required to finish a pint of beer during the piece. Is that great or what? Eleven short plays are on tap (pun intended), and they range from hysterical to poignant. Some cover life’s bigger moments–a bat mitzvah, divorce, death. Some capture unlikely scenarios, such as running into Shakespeare in a bar and a pontificating, philosophical drunken llama. (In fact, there are so many different kinds of plays that if one isn’t your cup of tea, another one happens before you’ve had a chance to think too much about it! But I enjoy them all.) It’s a fairly roomy space, but because it’s not only a pub but a restaurant with tables to accommodate the dinner crowd, there is a limit to how many people you can cram into available spots. Luckily, the food is good and there’s a full bar, so we’re planning to arrive early and eat dinner while we stake out seats. You can still see the festival 8:00-9:30 tonight or catch its final performance next Monday, August 29. PianoFight is at 144 Taylor Street in San Francisco’. Oh, and it’s FREE!